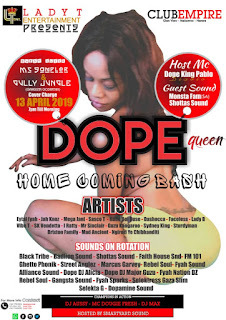 According to South African based entertainer DopeQueen, all is set for her homecoming party that is being hosted by CLUB Empire in Glenview, Harare on the 13th of April. She confirmed as much while speaking to Urban Craft magazine recently. Hosted by Smartyard Sound International, Champions in Action, Mc Dougie Fresh, Dj Aussy, Dj Max alongside Dope Nation Boss @Pablo DopeKing of LadyTee Entertainment, the event is slated to have as many as 20 sound systems participating and more than 18 artists performing. The lineup of artists for the event includes names like Eyetal Fyah, Mr Syncleer, Dashocca, Doctor Murda, Rudeboi Duse, SK Vendetta, Jahnoz, Sasco Tee, Guzu Kangarue, Mad Ancient, Sydney King, IRatty, Mega Jani, LadyBee and Vybz T, to mention but a few. 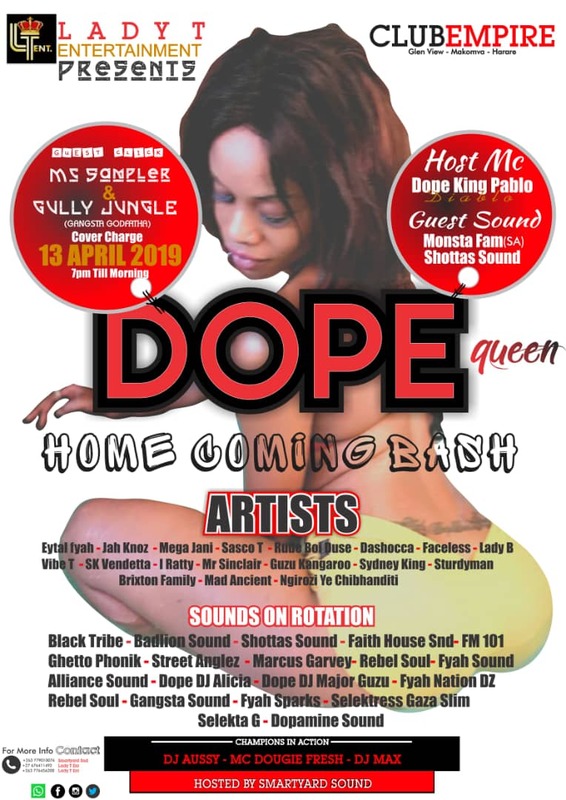 Dopequeen said that during her stay in the country she plans on taking a tour of some of the capital’s ‘most happening’ spots and also hopes to put together a hiphop/dancehall event, among other things. “I am planning to do a hiphop and dancehall fusion event during my stay and to affiliate myself with the hiphop sector which has almost no hype at all in my country. My 3rd event will strictly be a ladies affair, from the emcees, Djs, to the artists themselves”, she said. Apart from it being a unique opportunity to mix and mingle with her family, industry counterparts and fans, she sees her visit as a good foundation to put forward her team’s agenda, that of putting women at the forefront. “Our focusing is on achieving one of our main goals, that of shining the spotlight more on women and helping them find their footing in this male-dominated industry. We’ve come to pioneer and support females in all aspects of the music industry that men have conquered over the years including marketing and the distribution of the music”, said DopeQueen.